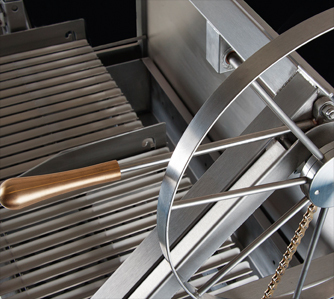 As with any commercial cooking equipment, chefs demand reliability, durability and efficiency. 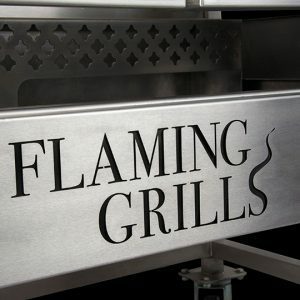 Flaming Grills has used 21st Century technology, materials and design to ensure chefs can trust and rely on their live fire cooking during service. An authentic asado is all about wood - as a source of fuel and flavour. 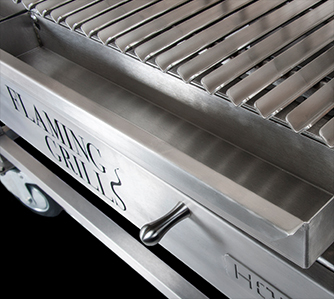 Our grill has a full length fire box enabling chefs to produce their own wood ember charcoal efficiently and easily. Light the hard wood, wait for the burn and then distribute the charcoal across the grate, adding more or less to different areas to manage your cooking zones. 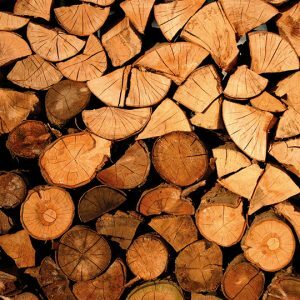 Simply add new wood to top up and to maintain a constant cooking temperature. 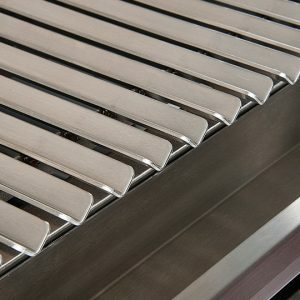 Another distinctive feature are the V-groove grills. 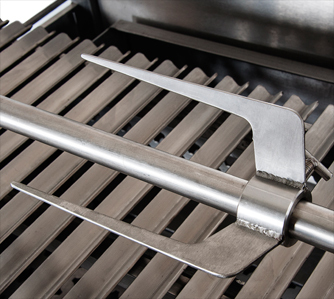 They are designed to channel juices directly into the drip pans and not onto the charcoal. 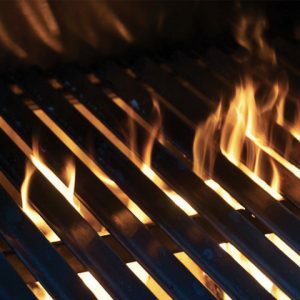 With juices continually falling onto the charcoal, this can cause flare ups which produces uneven cooking and ‘dirty’ charcoal. 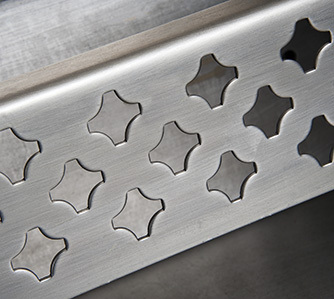 V-grooves adds to this grill’s incredible heat control and accuracy. A simple but incredibly useful feature. 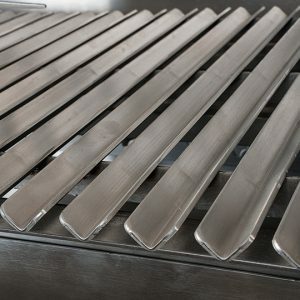 The juices are collected in these pans from the v-groove grill and can be used for basting and seasoning the food. They are removable and easy to clean. Having the ability to raise and lower the two grills allows chefs to control the distance between the food and the wood ember charcoal. 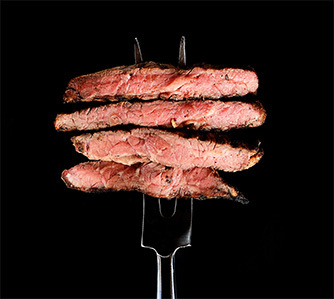 This is a fundamental feature of Argentine grilling and offers chefs a huge spectrum of temperature control allowing more cooking versatility. We couldn’t design the ultimate Argentine Grill without a heavy duty, load bearing, weather proofed rotisserie. 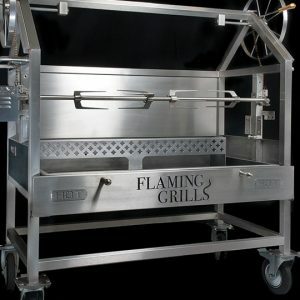 Simply remove the two grills and attach the height adjustable rotisserie and fire way! 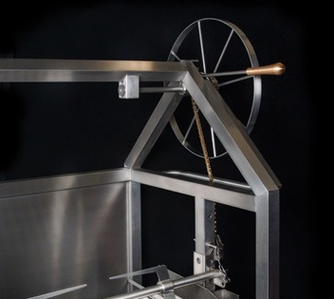 With a load up to 30kg, spit roasting has entered alfresco, home garden and commercial kitchens. One or both grills can be removed, so that you can also grill and use the rotisserie at the same time, for great versatility. Built in sliding shallow ash drawers for easy emptying/disposal of ash. 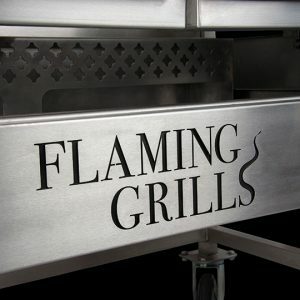 Folding heat shield door with handle, folds down against the grill with laser cut Flaming Grills brand logo. 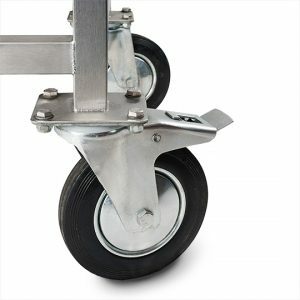 Tough strong, heavy duty CE/NSF approved braked wheels/castors. 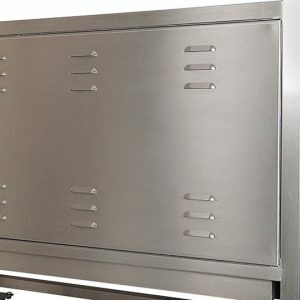 Hand welded 304 grade brushed stainless steel frame/body including the lift system that cranks the cooking surface approx. 16” above the fire. 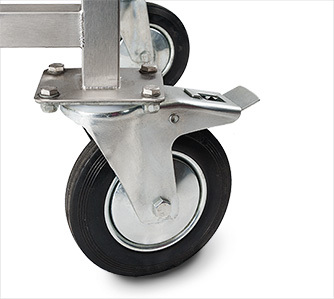 Tough strong heavy duty CE/NSF approved braked wheels/castors. 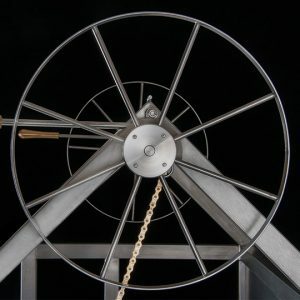 Hand Brushed Stainless Steel spoked crank wheels for adjusting grill surface cooking height using a strong chain and cog lifting system. 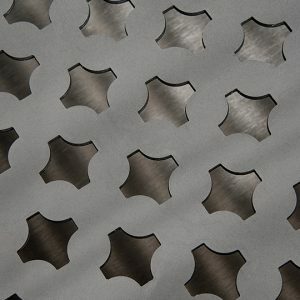 Tempered steel fire grates for high heat & long life and even wood or charcoal burn. Built in sliding shallow ash drawers for easy emptying/disposal. 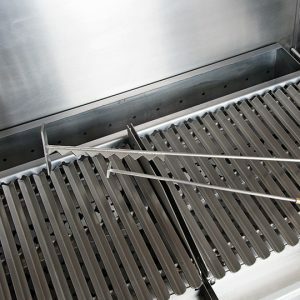 V channel grill surfaces for catching meat juices (tilts to gentle 4 degree angle or adjustable to lay flat), removable when using Rotisserie and for easy cleaning. Basting tray pans for catching concentrated meat juices, for that meaty smokey flavour. 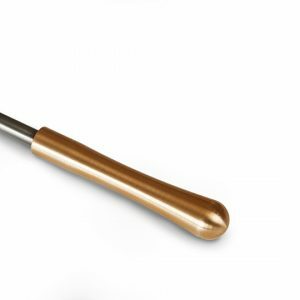 Solid brass handle V channel persuader tool, for scraping and moving meat and juices down the V channels. 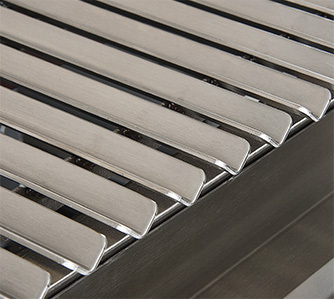 Double skin pressed and profiled brushed stainless steel rear heat shield with vents. 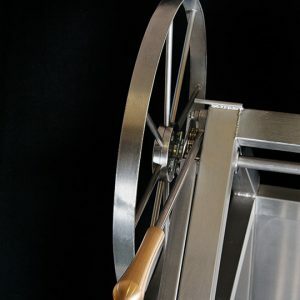 Heavy duty Rotisserie system, with profile cut stainless steel forks and heavy duty, stainless steel motor spec 220 volt/50-60 herts 30kg load capacity, with single piece high grade heavy walled stainless steel skewer. Cooking can start once you have a steady flame or glowing embers. Will burn all suitable hard woods, fruit woods, and charcoal. Cooking/grilling area 3ft square per grill, or total of 6ft square both grills. 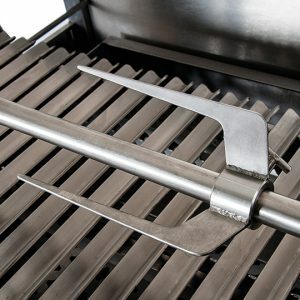 Rotisserie and grill can be used together for more versatility, by removing one of the grill surfaces. 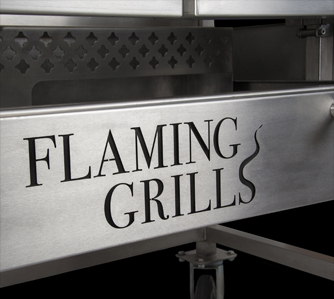 Dedicated full length tempered steel fire box for feeding the Grill with live embers. 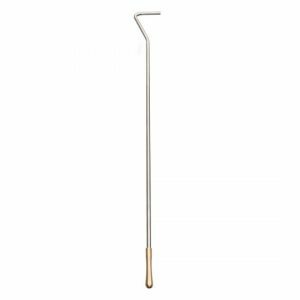 Dedicated solid brass handled wood/charcoal rake.